Sophomore point guard Kamar Baldwin brings the ball up the court and calls a play. Baldwin picked up seven points against Kennesaw State on Nov. 10. Photo by Jimmy Lafakis. When: Nov. 12 at 6 p.m. The Butler University men’s basketball team opened their season Nov. 10 with a win over Kennesaw State University at home. Now the Bulldogs welcome last year’s Ivy League champions Princeton University in what many expect to be a tough matchup for the Bulldogs. Here is everything to know before Sunday’s game. The Bulldogs took an 82-64 win Friday in LaVall Jordan’s first game as head coach. Butler’s offense had a huge game, especially in the beginning. Butler started the game on a 20-4 run, and in the opening eight minutes, Butler had a 22 point lead. The second half saw some hiccups from the Bulldogs which allowed Kennesaw State to reel in Butler’s lead, but they never got closer than 10 points. A 12-3 Butler run helped the Bulldogs secure the win. Senior forward Kelan Martin led the team with 20 points, while redshirt junior Paul Jorgensen had 14 in his debut game. Senior forward Tyler Wideman added 13 points to the board. Also, Butler outscored the Owls 50-16 in the paint and had 22 layups compared to Kennesaw State’s seven. The Bulldogs struggles most at the free throw line, shooting 12-23 for 52 percent. 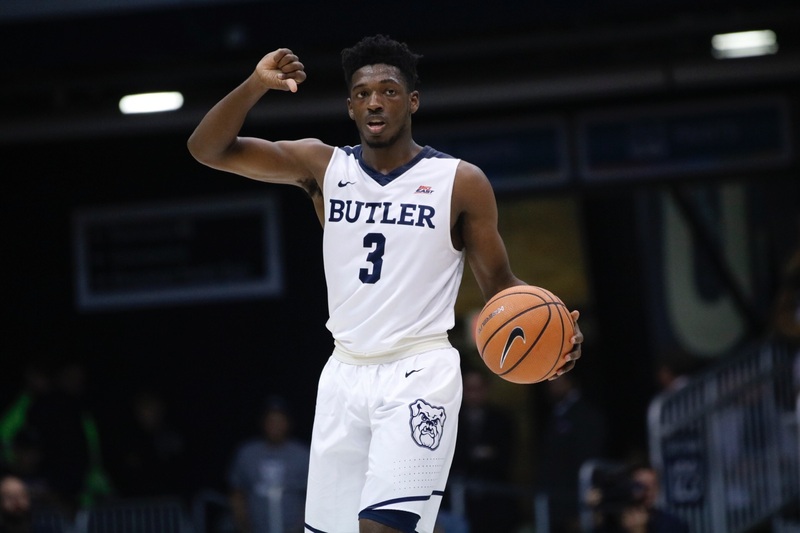 Butler’s star forward Kelan Martin has scored a combined 44 points between the two exhibition games and the season opener. Paul Jorgensen has come out of the gate strong in his debut at Butler, scoring 27 points thus far. Redshirt sophomore Sean McDermott has also put up the points, scoring 23 points between the three games. Freshman guard Aaron Thompson has quietly had a solid start to the season. In the three games so far, he has 17 points, 10 assists and six steals, with his most well rounded game coming this weekend against Kennesaw State. Sophomore point guard Kamar Baldwin has racked up 34 points, the second most on the team, eight assists and six steals thus far in his transition to the new position. While he didn’t have the best of days on Friday, failing to score in the first half, he is still a force to be reckoned with on the court Sunday evening. The Princeton Tigers are not a team you can push to the side. They went 14-0 in Ivy League play last year and won the Ivy League Tournament. They lost in the first round of the NCAA Tournament against Notre Dame 60-58. Last year, Princeton won 20 games and finished the regular season on a 17 game win streak, 19 including the Ivy League Tournament. Junior guard Devin Cannady comes into the game with many eyes on him. In just two seasons, he has 138 points from three’s alone, which puts him just outside the top-10 in Princeton’s all-time list and makes him a must cover for Butler outside the arc. In total last year, Cannady scored 403 points and averaged 13 points per game. Cannady and others have helped Princeton create one of the top offenses in the country. The Tigers ended last season atop the list of fewest turnovers with 298. They were fourth in fewest fouls, fifth in turnovers per game and ninth in scoring defense, allowing an average of 61 points per game, and 12th in threes per game at almost 10. These two teams have played each other three times in program history, and Butler leads the series 3-0. The most recent game was in 2013 when Butler won 70-67. The last time the teams played before then was 1955 and 1962. Butler looks to keep their home non-conference winning streak alive with another win Sunday evening. The Bulldogs have not lost a non-conference game at Hinkle since they lost to Pittsburgh in the College Basketball Invitational in 2012. That makes for a 36 game win streak inside Hinkle Fieldhouse.